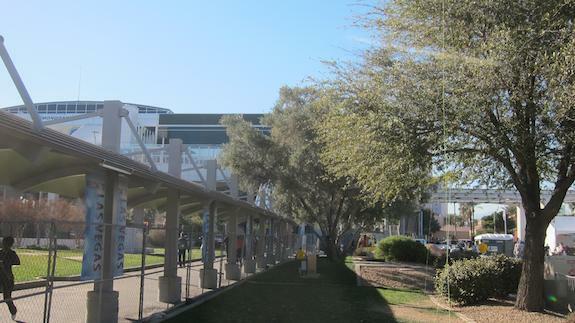 It was a warm, sunny, 70 F-degree day in Sin City on January 22, 2014. I’ll remember the day, the place and everything around me just like that night in my father-in-law’s basement where I stole the first kiss from my wife. 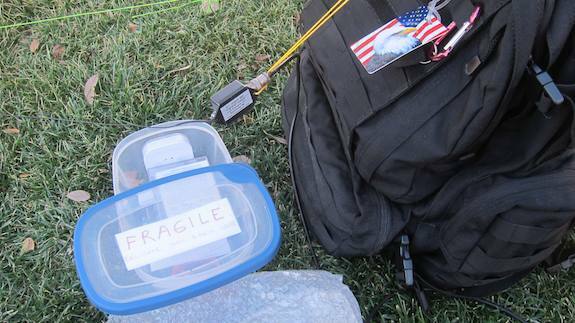 You may think I’m nuts, but traveling 2,731 miles with all my tiny radio equipment to make a QRP QSO for the first time will do that to a fellow. 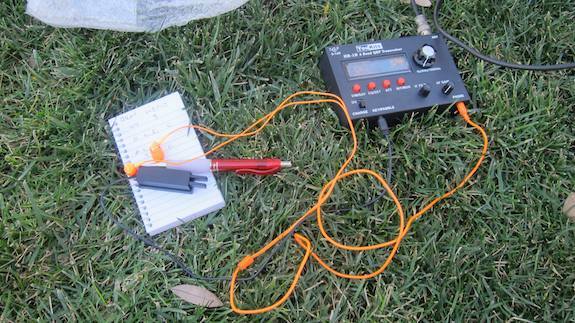 QRP is a Q-sign acronym that’s used between radio operators asking if they should reduce power. It’s loosely used among a small group of ham radio operators that prefer to transmit at power levels of 5 watts or less. Once you do that, say transmit at 1 watt and the signal goes thousands of miles and is heard by another operator, you can get hooked. Anyone can blast a signal at 50, 100 or even 500 watts. What’s the challenge of that? A QSO is another Q-sign acronym that stands for a completed two-way communication between two radio operators. Just six weeks before I received in the mail a used, but in mint condition, HB-1B quad-band transceiver. It’s a dandy little radio that allows you to do ham radio from inside your home, on top of a mountain or anywhere in between. This little rig is compact, easy to operate and rugged. My mentor, Jim Cluett – W1PID, got me hooked on outdoor radio months before. I lusted being able to do what he does each week when the weather cooperates. He specializes in QRP outdoor radio and since I love being outdoors too I was immediately attracted to this aspect of ham radio. “Guess what? I’m going to the World of Concrete show and I’m going to take my HB-1B rig with me,” I mentioned to Jim about a week before I left for Vegas. “Sure.” Jim’s a firm believer in less said is better. He’s a master at many things including wry humor and masking his true emotions. Every now and then I’m able to break through his defenses and something I say or do elicits an extended belly laugh. We agreed that I’d scout a location once there and let him know when I’d be set up and on the air. I was to arrive in Vegas on Tuesday afternoon around 1:30 p.m PT and my afternoon and evening were booked solid with a media event put on by Bosch Tools. They were hosting my visit to the show and I was honored and excited about seeing their new tools. Because of the three-hour time zone shift, I knew I’d be up long before dawn the next morning. Sure enough, I popped out of bed at 4:05 a.m. PT. The only reason I wasn’t out of bed at 3 a.m. was because I had stayed up until about 10:30 the night before attending the private dinner put on by Bosch Tools. I was pretty tired having been up for almost 21 hours. My plan was to scout the pool area at the Mirage casino/resort where I was staying, but it didn’t open until 10 a.m. I had to be at the convention center by 9:15 a.m. so that was out. My HB-1B, the roll of microcord to hoist up the antenna, my endfedz multi-band thin-wire antenna, headphones, etc. were all in a nice compact tupperware container ready to stuff into my backpack. My Pico paddles were in their own small plastic box to protect the precision tool. Bosch Tools had given me the day before a welcome bag filled with goodies including a 16-oz bottle of Fiji water. That’s exactly what I needed to get my microcord up into a tree to pull up my antenna. I was ready to roll! I had some business to attend to at the Las Vegas Convention Center, the site of the World of Concrete show. Around 3 p.m. I was finally able to get on the air. The only trees I could locate that might work were these bushy ones near the covered walkway that lead from the South Hall to the overhead monorail mass-transit train that stops at the convention center. This was not ideal because so many people were walking past me. Fortunately temporary chain-link fencing separated me from them. It was time to set up. I unpacked all my gear and got ready to throw the 1/3-full Fiji water bottle over the tree. I didn’t do so well. 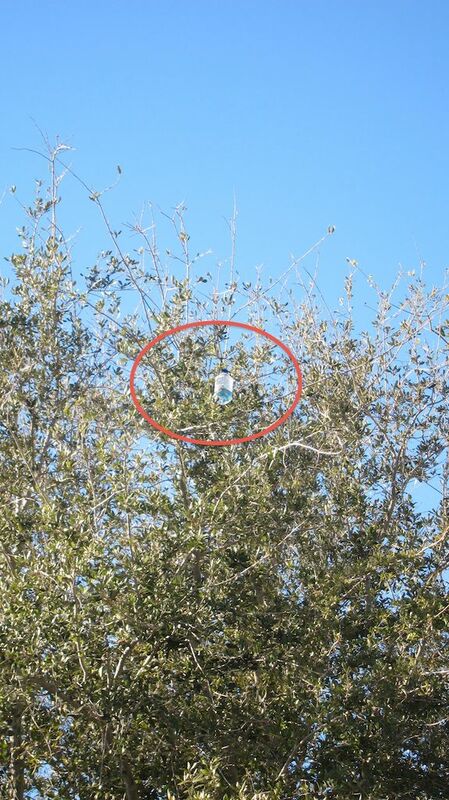 After three attempts, my bottle was snagged by the newly named Tree of Death. The bottle was not coming down without a chainsaw. Fortunately I had tied the microcord rope loosely to a larger diameter parachute cord and I was able to get my microcord back out of the tree. I looked for a rock and promptly tied the cord to it and whipped it up into the tree. I was able to tug on the microcord and get the rock to drop to the ground. In a few moments I had my endfedz multi-band antenna up in the tree. It was by no means perfect because I was hesitant to pull it too close to the branches of the Tree of Death. I could see how the antenna could be snagged with ease. I was left with a pathetic sloper antenna that had the shape of a rough question mark. I was convinced my antenna would not work well. Jim had told me time and again I’d get the best results if the antenna was straight up and down. Well, that’s not happening today for me. 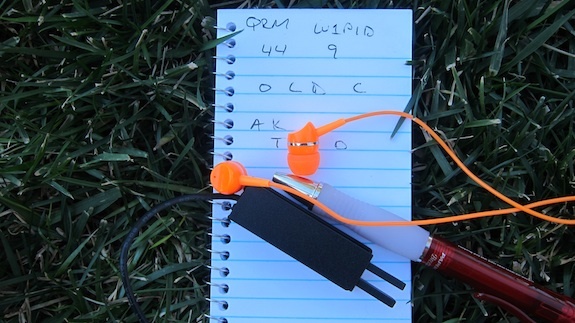 After connecting the antenna to the HB-1B, it only took a few minutes to connect my earphones and my sweet Pico micro paddles to the rig. I feel it’s mandatory to have the antenna connected to the radio before powering it up. I don’t want to risk transmitting by accident without the antenna to absorb the energy. I had the radio set to 20 meters and went to 14.050. I had texted Jim about 15 minutes earlier telling him I was close to being on the air. He texted back asking me where I’d be on 20 meters. I originally sent 14.050. He was already in his shack waiting for me. It was a little noisy so I scooted down to 14.045. I quickly texted Jim telling him to move to that frequency. I was filled with excitement. Would he hear me? Could I hear him? Would the band be open? Did I have enough power to make it back to New Hampshire where he was sitting in his shack? It was time for my first QRP outdoor QSO. OH MY GOSH! IT’S WORKING! His signal was faint and I was only catching about 60% of his transmission as the signal faded in and out. But I was HEARING him! How cool was that? What are the chances we’d both hear each other? I was transmitting at 4.5 watts and he was blasting out at 75 watts to try to get to me. I gave him a 449 RST and he gave me back a 449, or at least that’s what I was able to extract from the the ether. I then heard him send in the fading signal, O L D C. Later on the phone he told me he sent: COLD COLD COLD because it was bitter cold back home. That fast it was over. But I HEARD HIM! I was bubbling with joy. It was worth all the effort and risk. After the QSO was over, Jim called me on my cell phone. He was as excited as I was because he knows far more about ham radio than I do and realized it was simply amazing we could complete the QSO. “It’s not uncommon for just one person to hear the other and the other hear nothing. It’s all a matter if that HF radio pathway is open,” Jim said. Indeed it is – and that’s part of the attraction as far as I’m concerned. You never know who you’ll connect with and what might happen. Jim told me before we hung up on the phone he was afraid he’d have to bail me out of jail as the convention center police might think I was some sort of terrorist. I was prepared with my wallet-sized copy of my FCC license, but even still in these times one never knows. I can’t wait for the weather to break here in New Hampshire so I can get outdoors more often to operate the HB-1B. Fortunately I’ll be in sunny southern California the second week of February, 2014 on business. I’m taking the HB-1B and all my gear. I plan to operate from a few mountain tops and from the beach of the Hyatt resort at Huntington Beach. A friend I’m visiting has his kite all ready to get my antenna up in the air at the beach and possibly on the mountains! I hope you and I can do a QSO soon! Be sure to ask me if I’m QRP. I purchased a used HB-1B Four Band CW QRP Quad-Band transceiver in December of 2013. It was in mint condition. Today I finally got to spend some time with the little rig. I was trying to figure out how to switch between the internal speaker and the headphones. The distributor of the HB-1B, Ten-Tech has a video of the HB-1B on YouTube where they run through all the features of the magnificent radio. The video is embedded below and you can clearly hear audio emanating from the radio at 4:09 in the video. I urge you to watch the video. Because the HB-1B does NOT have an internal antenna tuner, I turned on my ICOM-7000, went to 20 meters, and tuned my zepp di-pole 80/6-meter antenna so I had a SWR of 1.5. The band was very active. There were more di’s and dah’s spewing from my ICOM-7000 than water from a 2-inch fire hose at a three-alarm fire. I removed the antenna cable from the ICOM-7000 and connected it to the HB-1B with a BNC adapter. I turned on the HB-1B and nothing. No sound came from the radio even though the LCD display was showing plenty of voltage and everything was fine. I plugged in my Bose earphones and I could clearly hear all sorts of QSOs in progress. I unplugged my headphones hoping to hear sound and nothing, even though the 20-meter band was lit up brighter than Jupiter on a clear December night. Nothing. NO SOUND was coming out of the radio. Dang it, was the speaker broken? I looked for a switch. Nothing. Finally, I got out the simple two-page manual. Nothing. Not a thing about how to switch between the earphones and speaker. GRRRRRRRRRR…. Guess what? The HB-1B has NO INTERNAL SPEAKER! The folks at Ten-Tech that taped the video obviously had a small external speaker – you can see the green jack in the lower right corner of the rig when you watch the video – connected to the rig. If you don’t want to use earbuds or a small headset and want to have audio others can hear while you operate, you’ll need to purchase a small speaker you can plug into the phone jack at the lower right corner of the handsome HB-1B. Did this blog post help you? I invest time writing and taping videos to help other hams like you save time and lower their blood pressure. Frequently equipment manuals are lacking key details that cause frustration. I’m trying to fill in those gaps when I can. If this post saved you some frustration, I’d appreciate it if you’d consider making a simple donation – even just a buck – using the PayPal button below. The more donations I receive, the more time I can devote to helping you.